The following article appeared in the Nov. 4, 1973, edition of the Mansfield News Journal. It was written by a United Press International reporter. CLEVELAND -- Army Reserve helicopter pilot Capt. Lawrence Coyne is a military commander who doesn't believe in unidentified flying objects (UFOs) or little green spacemen. But after a near miss two weeks ago between his helicopter and a "big, gray, metallic-looking" object in the sky over Mansfield, he doesn't know what to think. He said a check turned up that none of the unit's F-100 Super Saber Jets were in the air when the UFO appeared. Coyne said when he first encountered the UFO, his helicopter was cruising at 2,500 feet. He had the controls set for a 20-degree dive, but the craft climbed to 3,500 feet with no power. "We looked up and saw it stopped right over us," Coyne said. "It had a big, gray metallic-looking hull about 60 feet long." "It was shaped like an airfoil or a streamlined fat cigar. There was a red light on the front. The leading edge glowed red a short distance back from the nose. There was a center dome. A green light at the rear reflected on the hull." Coyne said the green light swiveled like a spotlight and beamed through the canopy of his craft, bathing the cabin in green light. He said as he and members of the crew stared at the craft his helicopter began to climb without his guidance. Coyne said the UFO finally moved off to the west and was gone. MANSFIELD -- Thirty years ago tonight, strange things were happening in the skies over north central Ohio. A close encounter in Mansfield, that has since become known as "The Coyne Incident," is still raising eyebrows among believers and UFO investigators. That evening, in a soybean field on the west side of Galion, Rene Boucher and her brother Brad encountered a bright light in the sky that has lured her from Florida for another sojourn into that field. It was about 11 p.m. on Oct. 18, 1973, when an Army Reserve helicopter came perilously close to colliding with an unidentified flying object. Arrigo "Rick" Jezzi, 56, who now lives in Cincinnati, was flying the Huey helicopter that night. Three decades later, he is still not sure what happened. Jezzi was one of four members of an Army Reserve unit based at Hopkins Airport in Cleveland on board. The crew was en route to Cleveland from Columbus. "Capt. Larry Coyne was the pilot," Jezzi said. "I was in the left seat, actually flying the Huey at the time. We were near Mansfield flying at 2,500 to 3,000 feet." 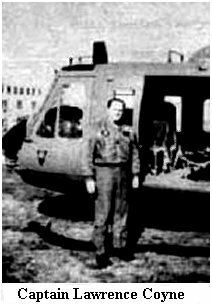 John Healey and Robert Yanacsek were in the back of the Huey, near a cargo door with a Plexiglas window. "One of the guys in the back reported a red light. He said it looked like an aircraft light on the right horizon," Jezzi said. "I couldn't see it." Jezzi was flying from the left seat. On the other side of the Huey there was a 12-foot section of fuselage between the side window and the cargo doors. He figures the red light was in his blind spot. "Then I heard 'I think its coming toward us'," Jezzi said. "The next thing I knew Larry took control of the throttle. We went into a maneuver, a controlled free fall. We dropped about 2,000 feet." Jezzi said if Coyne had not made the drastic maneuver there would have been a collision. "It took just a couple of seconds," Jezzi said. "I remember looking up through the ceiling and I saw a white light moving over top of us. I followed it to the left horizon where it disappeared." Jezzi isn't sure what he saw. It was like no aircraft he'd ever seen. He guessed it was traveling at least 500 knots, twice the speed of his Huey. "Red navigational lights aren't located in the front of an aircraft," he said. "That's what was moving toward us. I don't know what it was." The incident was documented by witnesses on the ground. In UFO lore the "Coyne Incident" is regarded as one of the most reliable UFO sightings of all time. "It caused a lot of hullabaloo," Jezzi said. "The first thing I thought was those Commie bastards. What are they up to." 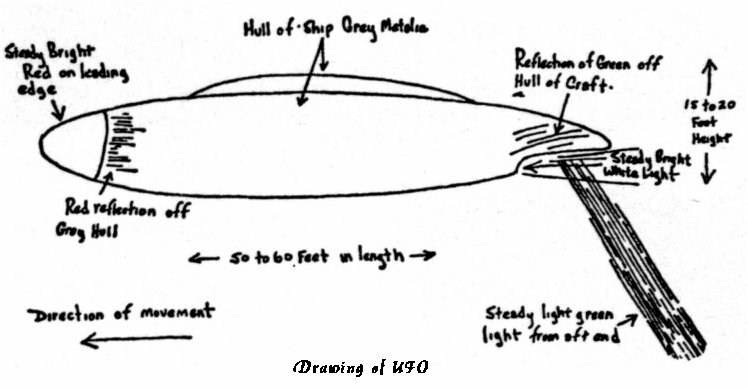 The next morning two of the other crew members, while being questioned about the incident, sketched drawings of the cigar-shaped craft they observed. "They both came up with similar drawings," Jezzi said. The magnetic compass in the Huey never worked right after the incident and had to be replaced. Rene Bouchard doesn't know what she saw in Galion about 60 minutes earlier that same evening. "I was in high school. My brother was in junior high," she said. "There had been a lot of sightings in the days and weeks before that. Even the governor reported seeing something. We thought we'd give it a try." She and her brother walked out in the field behind their home and started watching the sky. "We saw a bunch of stuff that looked like it was maybe 30,000 feet in the air," she said. "But it wasn't anything spectacular. Then I think we both put our heads down for some reason. That's when we saw this brilliant white light. It was as bright as the sun. I don't know what it was but it scared us. We ran for two blocks until we got home." Rene has since moved to Florida. Her brother is in California. She's back in Galion today and plans to go out in that same bean field to spend part of her evening. "We really saw something that night," she said. "I don't know what it was. But I'll be back there (tonight). I called my brother and asked him to fly here so he could go with me. He said no. I'm not expecting to see anything. But I'm going to be there."